The clue is in the heading. This is indeed Edgar Westbury's own much modified motor from his hydroplane 'Golly'. 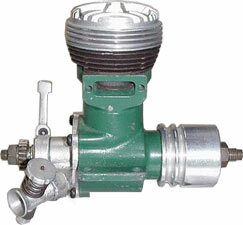 The engine was first described in Model Engineer in 1935 and then illustrated several times in subsequent years. What makes this discovery so exciting is that it forms part of a collection of original Westbury engines and associated material that has been in the families possession since the death of ETW in 1970. Not only is the provenance beyond question, but as can be seen, none of the items has been touched in the intervening period. OTW is delighted to be able to share this item and in due course will bring you further details of this and of all the other original engines, as well as anything else of relevance that comes to light. The 'Bonzone' was designed by S.W. Phillips and produced by Bonds 'O' Euston Road from around 1926 to 1930/31. 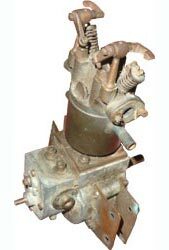 With its radial valve head it was a significantly better engine than the Simplex which replaced it, although it was only a change to a basic parallel valve head that distinguishes the two motors. It is suspected that it was the cost of machining the head for the company, or the difficulty of machining for the home constructors, which decided Bonds to drop it from their range. The Simplex sold for half the price of the Bonzone and is still relatively common. This rare example was missing several vital parts including camshaft, push rods, contact breaker and carb, yet still sold for over £200. The only other example we have seen had the valve seats missing the combustion chamber fore and aft and, for this reason, remains unfinished . The 'Simplex' as the name suggests was a more basic motor than the previous offering from Bond's, and cheaper as well. 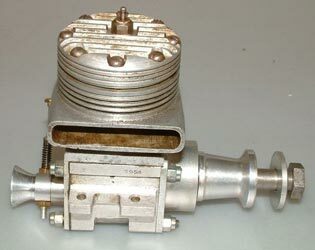 Most of the saving was in the cylinder head, a backward step in performance terms. Even with more advanced head designs, this engine was still woefully underpowered for serious hydroplane work. This is the 'racing' version cast in 'Electron' magnesium alloy, but with a float carburettor rather than the optional racing venturi. Further details of these engines are available on the 'Bonds' page. 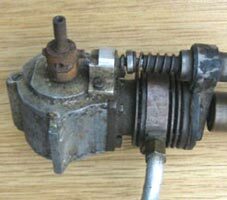 Identifying these motors is always tricky as almost identical engines were produced by Bonds, Grays and Gamages. F.N. Sharpe is credited with the original design, marketed by Economic Electric, although it appears in several guises from the late 1920s. The bronze cambox is a good guide and a look at the conrod can be most revealing, as the Grayson conveniently has Gray in raised lettering along its length. 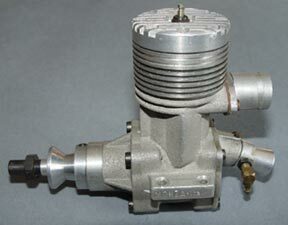 This example still has the early updraught intake and the screwed in exhaust and intake. It is destined for a period straight running hull, although with a bit of RC to keep it going in the right direction! Hardly an appropriate name? 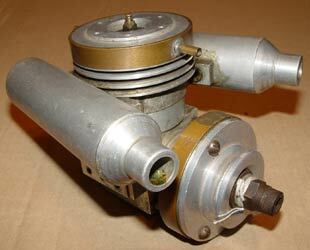 Another 10cc racing motor that did not make it. 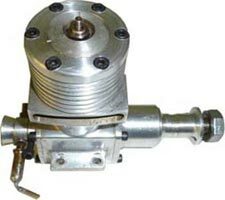 Approximately 12 'Speedwell' 10cc motors were produced down in Rochester, Kent around 1947/48 by well known tethered car racer Ken Robinson. There are some similarities with another engine of Kentish origins, the Pioneer 10, for reasons that we hope will be explored in a more detailed article by someone who knows 'far more about it' than we do. The general opinion is that they were not very successful for a variety of reasons, including porous castings. Of the 12 built, 3 are known to survive and a 4th may be in circulation out there. 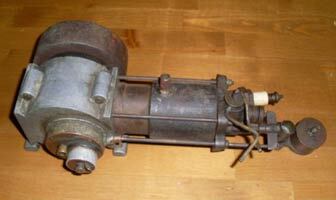 We would certainly love to hear from anyone who has one of these very rare motors. This motor did cause a bit of confusion at first, but it would seem that someone has built a uniflow flash steam motor out of either a compressor or an IC motor. The cam on the crankshaft would indicate poppet valve admission, and all in all, it might well have worked. Not sure about the lubricator though? This 'as new' motor turned up at a swapmeet and caused a deal of 'head scratching' until a long time tethered hydro and car enthusiast cottoned on. It is one of the very earliest OPS 60s from around 1970 before the initials appeared on the transfer ports, and the forerunner of a family of immensely successful motors, many still in use. 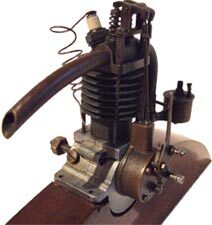 These early motors were used in cars and boats, but the Zimmerman disc valve meant that the motor could not be turned round, resulting in tuned pipes with U bends. Eventually a new crankcase solved that problem. Mind you, the OPS and Monza stamped on the lugs should have given a clue to its origins? 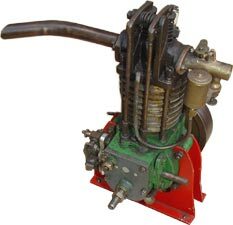 This horizontal twin boat engine is completely fabricated, which does give some clue as to its age and possible origins. 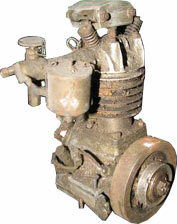 A similar engine was described in Model Engineer. It seems to be based very much on the work of the Arkell brothers and was rumoured to have some connection with them. 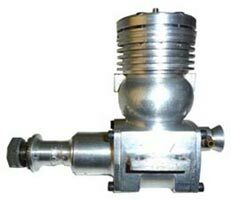 The use of pushrod operated inlet valves makes it significantly later than their better known motors. The owner would welcome any help in identification please. This must be one of the very earliest boat motors to ever come onto the market. It was supplied by Gamages of Holborn as a 'Racing Boat Motor' and adverts exist as early as 1913, so it may even be earlier than that. The cast feet show that it was specifically designed to lay flat in a boat hull, although arranging a drive might have proved interesting. A final sale price of £818 was conservative for what might be a unique example of model engine history. Another wonderful example of someone setting to and building a 10cc racing engine from scratch. The separate cylinder with its huge exhaust but moderate transfer passage is bolted to the crankcase via a flange, Hornet style. The choice of round head screws for the cylinder head is unusual as is the fixing of the front and rear housings with studs and nuts rather than screws. 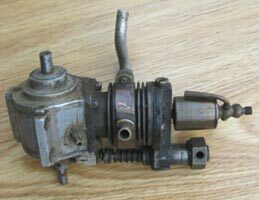 There are no clues at all as to who made it although the 1954 stamped on the crankcase flange could give us an idea as to when, making it relatively late. We were missing one vital photo that would have given us a clue as to the maker of this motor as his name was engraved very clearly on the face of the prop driver. Following an appeal for information on the MEN site, the following was received from Sam Alexander up in Scotland. I know the full history of this engine, being the person who first purchased the unfinished motor from Mr. Cameron's daughter sometime in the late nineteen eighties. Mr. Cameron had been a watch maker of some merit with a shop in the small town of Gatehouse of Fleet. In the late forties and early fifties, his hobby was building and running tethered racing cars. At the time I purchased this engine, I also acquired the remainder of his equipment, including hand-built cars, parts and the remainder of his engines - GHQ's Hornet's etc,. all of which have now been sold on. The Cameron engine was the last one on which he worked before he died. I gave it to a good friend who, like myself, was into vintage team racing and was also a qualified engineer. He stripped this motor, reworked it and made some new parts before returning it to me. 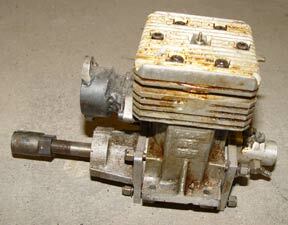 Over the years I never found a use for the engine so I sold it on my stand at the British Nationals swap meet, about 2006 - 8. This copy of George Lines' iconic design came from the collection of the late Gerry Buck. 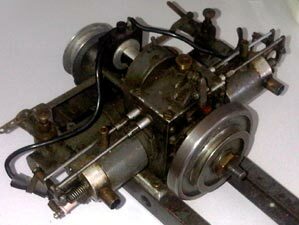 It follows the published design almost exactly, even to the brass rimmed flywheel. The obvious diversion from the plan is the brass water jacket on the head and a venturi that is significantly smaller than usual. Whether it was originally built in this configuration or altered at a later date is not known, but it must have been a handful in anything other than a hydro. The engine mounting blocks as per George's design would suggest that it was intended for a hydro hull. OTW had to sit on their hands when it came up for auction at Gildings!